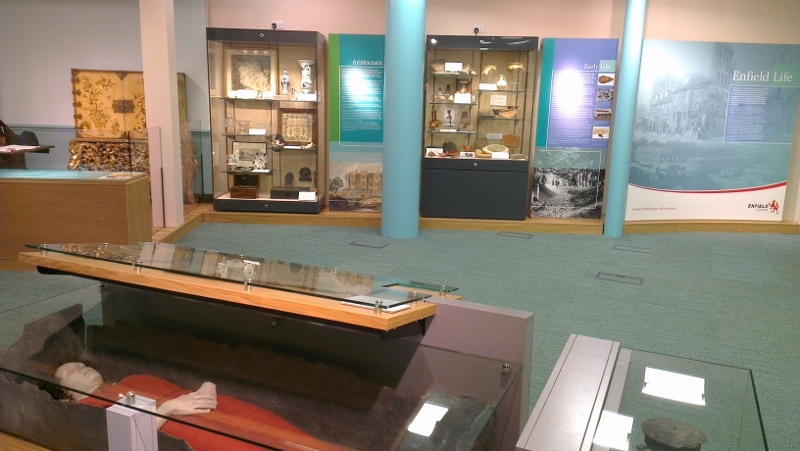 This is just a quick post about some work I’ve been doing for Hackney Museum. I have been volunteering with the Collections and Exhibitions Manager and had the pleasure of cataloguing a collection of photos by the Hackney photographer, Arthur Eason. The story behind these photographs, as well as the content, is fascinating. Over 2000 glass plates were discovered several years ago in derelict school in Hackney. These glass plates were in their original boxes and accompanied by the photograph studio’s original office stationery. From this it was discovered that the plates were from Eason & Co. studio, run by Arthur Eason, and based on Dalston Lane. With no clue as to how they got to the school or who had owned them between the closure of the studio in the early 1900s and the discovery in the early 2000s, their life as objects remains a mystery. We know that the majority of images are from the 1890s and were taken in Eason’s Hackney studio. Most of these images are portraits and they represent a rare historical window to life in Victorian Hackney. Subjects include newly wed couples, family portraits, possibly to celebrate a child’s birthday or other life milestone, and also promotion photographs for music hall acts. These promotional images even include some Victorian photography trickery with additional effects added by drawing on the negative. In addition to these there are fascinating images of Asian and Chinese people in both national and Western dress. It is thought that most of the images are of international Salvation Army delegates in Hackney to attend the International Salvation Army Congress of 1894. This is supported by the fact that many of the subjects have Salvation Army badges, but it is also supported by the Eason’s connection to the Salvation Army. 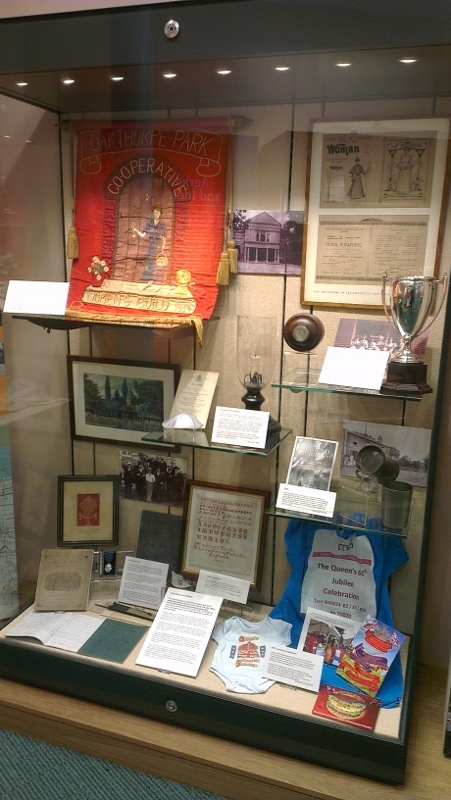 The Easons were very active within the Salvation Army; Arthur’s father, John Eason, was a close friend of William and Catherine Booth, founders of the Salvation Army, and Arthur went on a missionary trip to China in early 1880s. The relationship between the families was clearly maintained and there are even photographs of Booth’s grandchildren within the collection. I have been cataloguing Hackney Museum’s collection of Arthur Eason’s photographs, preparing them to be accessible through their online catalogue and so accessible to more people. This is a fantastic resource of the public and historians alike and I hope they are used in the future to tell many stories, from life in Victorian Hackney, Victorian photography and the history of the Salvation Army to name a few! Until then I will continue to catalogue to attempt to ensure they can be found by as many people as possible. Update: I should note that the legal owners of the copyright of the images belong to Bridgit Anderson and Jim Four, who kindly donated copies of some of the images to Hackney Museum. 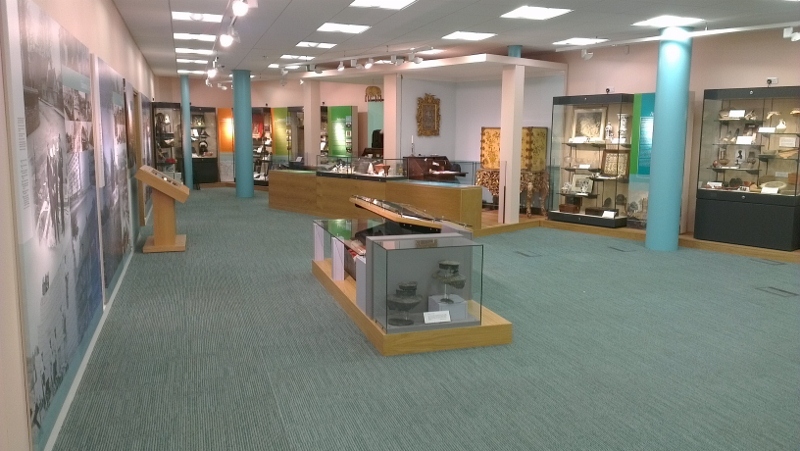 The images are up on Hackney Museum website now – go to their collections website (http://museum.hackney.gov.uk/home) and search ‘Eason’ and they’ll appear. Have fun! Through my recent volunteer work for Honeywood Museum I’ve had the chance to do some research into the history of the Sutton area during the nineteenth century. This has thrown up many interesting stories related to the industry of the area (being based of the river Wandle, there were many mills), and also the many institutions created to assist the unfortunate. 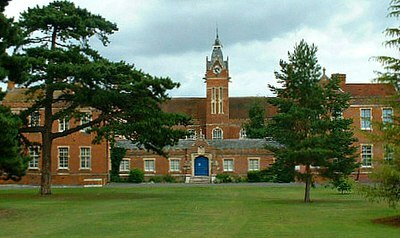 One of these institutions was the Royal Female Orphanage in Beddington. The Royal Female Orphanage was established in 1762 in the historic Carew Manor, in the beautiful setting of Beddington Park. Carew Manor was built in the 1500’s for the Carew family, a well-connected family who reportedly often had visits from Tudor royalty; however by the second half of the 18th century the family had moved out of the manor and the house was put to a different purpose. This purpose was to house, school and train girls with no parents or, more frequently, without a father or with parents who were unable to look them. They were schooled and trained to work in domestic service and once at a suitable age (normally about between 14 and 16 years old) they were sent out to work. The Sutton Archives has many of the records related to the orphanage, and I’ve had the joy of looking through the log of girls who had reached that suitable age. This holds a wealth of information in terms of social history and demonstrates the relationship these children must have developed with the orphanage. To encourage the girls to stay in domestic service and as a reward for their efforts, they were given a prize of £2 2s after two years of successful service. This was a continuation of many prize giving events that took place turning their time at Carew Manor, where prizes were given for good behaviour as well as merit in their schooling. The location and size of house the girls were sent to work in could vary greatly; some stayed locally to Carlshalton and Sutton however I found one girl, Florence Louisa Crago, who was sent to work for Lady Walpole at Hampton Court Palace. Domestic service wasn’t the only option for the girls, it is evident that some girls were ‘not strong enough for service’. Annie Elliot Bowe was sent into an apprenticeship as a dressmaker, and though this meant she was not eligible for the reward money, from orphanage’s records, she went on to have a successful career as a dressmaker. I was amazed at the length of time the orphanage kept in contact with the girls after they had left, sending out regular letters, they attempted to maintain this almost paternal relationship with the girls. This is demonstrated in Annie Elliot Bowe’s records; it notes that having taken up the position of Assistant Dressmaker in Devonshire in April 1893, in June 1896 she was ‘still at same place and doing well’. The writer of this note almost comes over as proud of Annie’s achievement. For many the contact ended once they got married or after a move, but it is clear that for others a strong relationship had been developed with the institution that brought them up. Alice Maria Robinson was born in 1874 and at the age of 16 went into service with Lady Margaret Lashington in Lyndhurst. Two years later she received her £2 2s reward and went into service for Lady Rothschild. In July 1898 Alice came back to the Beddington Orphanage to attend the Prize Distribution event for the girls at the orphanage, and had married Mr Charles Pratt. The fact that this is recorded shows the perceived importance of this by the orphanage, obviously Alice would have given the resident girls something to aspire to, but also embodied the orphanage’s pride and achievement. The final entry for Alice is for sometime later and of a sadder note, it reads ‘July 1920, Died of heart failure’, ending her long relationship with the Beddington Royal Female Orphanage. 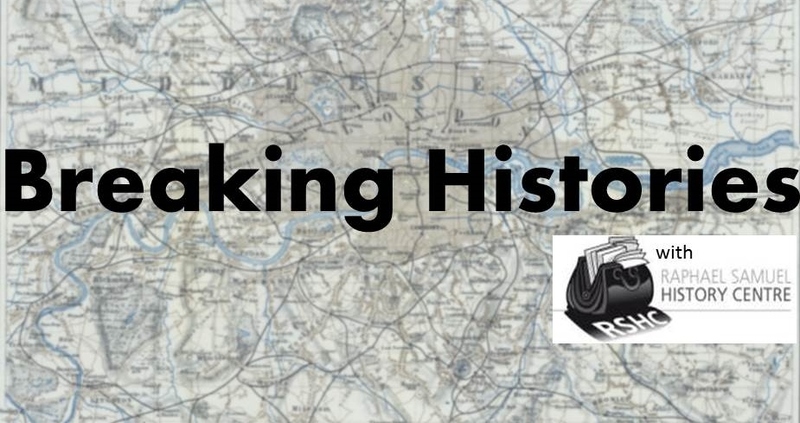 Over the past couple of weeks I’ve attended two of the free history events held by North Kensington’s community history group, HistoryTalk. Both of these events have looked at Portobello Market, the first consisted of a community discussion on the history of the market. Discussion was prompted by a slide show of photographs of Portobello through the years and led by two local historians, Eddie Adams and Tom Vague. The lack of a structured talk didn’t diminish the obvious knowledge and expertise of Adams and Vague, but allowed the group to discuss memories, ask questions and generally express their love of the area. I learnt a lot, including that the Antiques arcade ‘Admiral Vernon’, used to be a large greengrocers and florists called Jesse Smith’s, and also where Tesco’s is now used to be a dairy, run by recent Welsh arrivals to the area. Immigrant communities have been central to Portobello’s history, to its development and character, and though I knew about the Spanish community escaping Franco’s regime and Civil War, and of course the West Indian community, but I didn’t know there has also been a Welsh community of settlers who ran the local dairies. The second event was a screening of the film ‘Stall Stories: A History of Portobello Road Market‘. This was billed as a documentary made by the children at the local Colville Primary School, so I didn’t really know what to expect. Needless to say I was very impressed. We learnt afterwards that the film was a result of a HLF funded project led by an arts and educational charity, Digital:Works, which worked with four primary schools to make a film about their local market. The children did the research in the archives, spoke to local historians and then made the film, which meant they conducted the interviews and filmed them, their involvment didn’t reach into the cutting room, though they were shown a rough edit to give them a chance to make any changes. Some of the children who were involved came to the screening and also answered questions on the making of the film afterwards, and it was really inspirational to see the joy and pride they got out of the process, not only were they proud of their finished product but they also clearly enjoyed the historical research and practice of oral history. I was overjoyed when one of the girls said if she had to make another similar film her topic would be local black history, mentioning Claudia Jones and Kelso Cochrane. What was also notable about the film, was that it wasn’t just a straight narrative history, it demonstrated the significance of history to the present day and the strong sense of heritage today’s stall holders felt. Stall holders past and present where the celebrated feature of the film and were presented as being responsible for creating and sustaining the character of the area. It made a strong case for why Portobello should continue to be a place for local independent traders, with a regret for the continued increase in rents and establishment of corporate chains along the road. The film tells an emotive story and records a snapshot of life on the market today. It was good to hear that after it was made it was not only shown to the filmakers’ fellow students at Colville, but also to the market holders working on the market day by setting up a screening on it’s own stall one weekend. Some of the audience felt it needed to be shown to local Councillors, and I’m sure it does have some political strength, though I think it can also act as an inspiration to other children. History on TV, in a variety of forms, is at an all time high, from ‘Who Do You Think You Are?’ to ‘Downton Abbey’, and work like this can encourage students to engage with history in an alternative way, as well as giving them training and ideas of how historical research and knowledge could be useful in a future career. To my utter disbelief I am currently in an exhibition at the Museum of London. 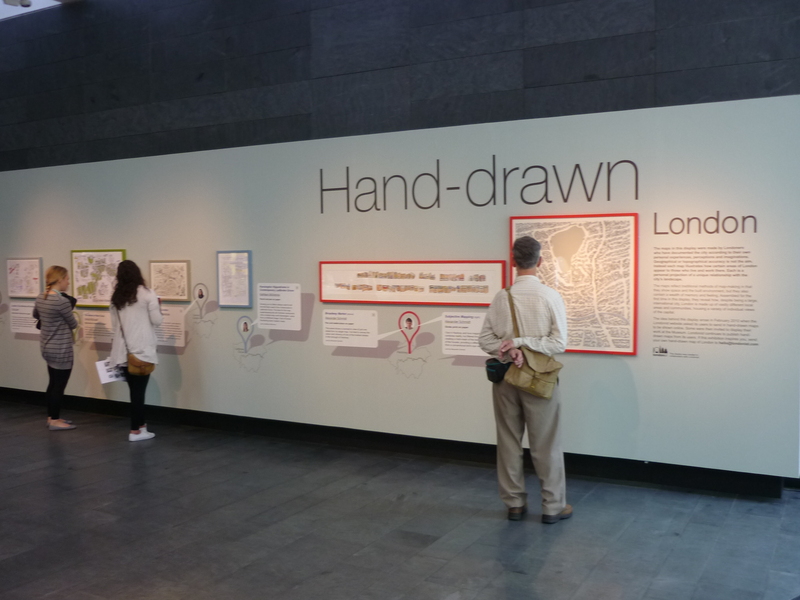 No, I’m not a time traveller or old enough to feature in stories of the Blitz or even the Brixton Riots, I’m not even an artist, but somehow my hand-drawn map is in the most recent temporary exhibition at the Museum of London, ‘Hand-drawn London‘. The exhibition is a collaboration with the Londonist website, and features ten hand-drawn maps hand-picked to represent different Londoners views and perceptions of the city they live in. There is a lovely depiction of Brixton as a tree, a very humorous insight into the world of an over-seas student whose world focuses on the Bloomsbury area with unmapped territory surrounding, and an intriguing look at London’s firsts mapping events and inventions that were premiered in London. You can find a preview with images of all the maps on the Independent website here. My map is ultimately very simple (seemed the best idea due to my artistic constraints), and is probably one of the few without much annotation. 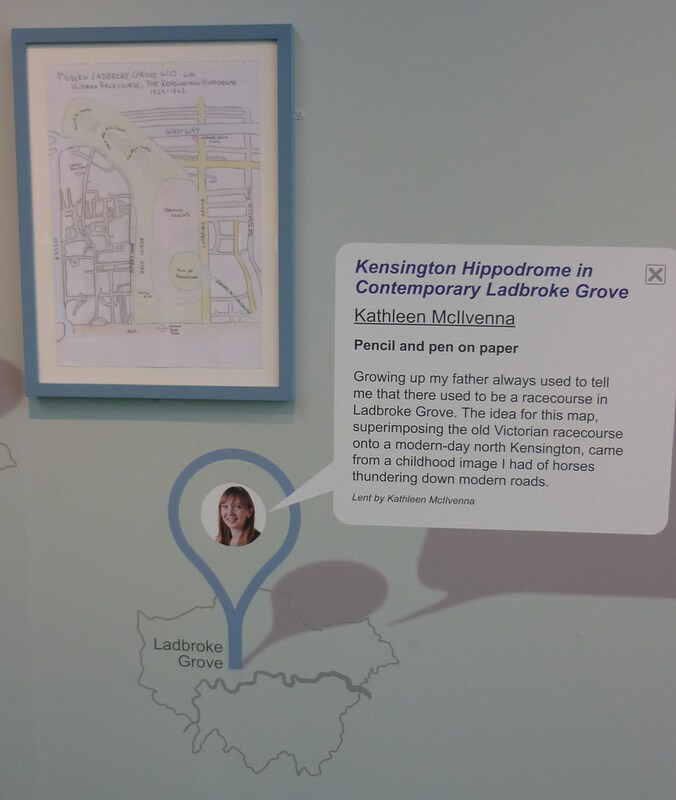 With my interest in local history and my love of North Kensington I used the hand-drawn map project as an excuse to research the long gone Kensington Hippodrome, a Victorian racecourse that stretched from Holland Road to modern-day St Quintin’s Avenue. When I first created the map I wrote a blog on the maps that influenced my final creation can be found here, but I’d thought I’d take this opportunity to share a bit more history of the Kensington Hippodrome. A Notting Hill racecourse was the brainchild of local entrepreneur called John Whyte. Situated on 200 acres of the Ladbroke lands, leased from James Weller, the Kensington Hippodrome boasted a larger capacity and closer proximity to London than the other famous racecourses, Epsom and Ascot. It opened on 3 June 1837 to much praise and acclaim from the sporting and national press, and it was soon considered to be a very fashionable place to be and be seen. However, there had been an oversight in Whyte’s plans and it turned out that his racecourse intercepted an ‘ancient public way’. Though apparently situated in a sleepy and leafy area, the Hippodrome had actually been built next to one of the worst slums in London’s suburbs, the Potteries, possibly represented by the chimney in the background of this painting. And this public way, or footpath, had become popular with the inhabitants of the Potteries and the nearby area as they attempted to avoid Pottery Lane, affectionately nicknamed ‘Cut Throat Lane’, to give you an idea of the undesirables that resided there. Whyte tried to block this footpath, but the locals were having none of it, and continued to protest, campaign and also dismantle any obstruction there. For the press this became a matter of class warfare, and to them it seemed acceptable that people should have a few hours enjoyment at the races without seeing the dregs of society, who kept breaking into the Hippodrome for free through the footpath. 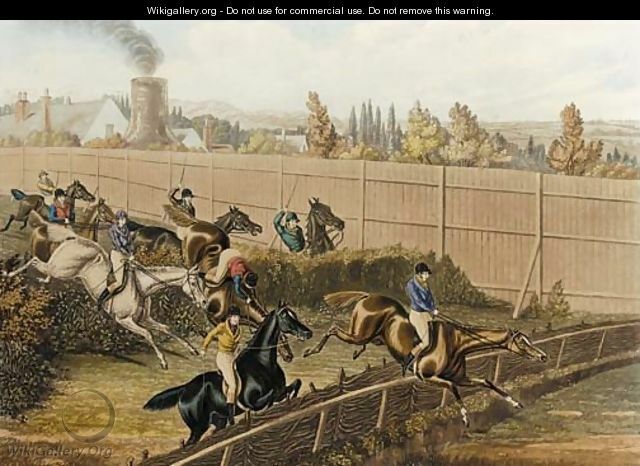 This wasn’t the end of Whyte’s problems, and though the Hippodrome had become fashionable (visited by the Grand Duke of Russia and other foreign dignitaries) and extended in 1841; the jockeys weren’t keen on the clay soil and began to shun the racecourse. Eventually Whyte admitted defeat and gave up the lease in 1842. With this Weller turned to the builders and the Ladbroke Estate was subsequently built over the racecourse. This wasn’t the end of racecourses altogether in the area and there was a course also called the Kensington Hippodrome built as part of Portobello Pleasure Gardens, featuring a track around the axis of Talbot Road. Also in the early 1850s there was a third Kensington Hippodrome, this time an equestrian extravaganza amphitheatre on the site of De Vere Gardens. Today the ghost of the Kensington Hippodrome still lingers in the area. 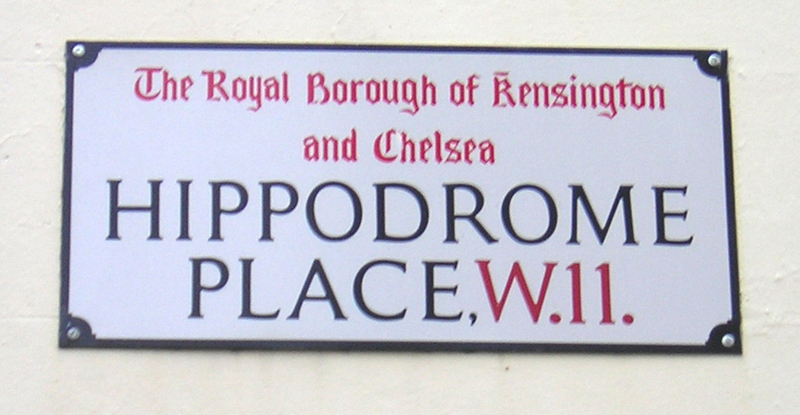 There is of course street names, Hippodrome Place at Clarendon Cross, between Portland Road and Pottery Lane, and also Hippodrome Mews, former stables. There are also several pubs in the area that date back to the 1840s and probably have origins in Hippodrome business; the Prince Albert in Notting Hill Gate at the entrance to the racecourse, and the North Pole on North Pole Road at the other end of the racecourse. Parts of the Ladbroke Estate were also built along features of the racecourse, most notably that the Notting Hill grassy knoll, that became the ‘natural grandstand’ is now where St John’s Church is situated, accessible by a gate which is now the main entrance to Ladbroke Square Gardens.